The persistent, non-native invasive alga Gracilaria salicornia has dominated the protected waters surrounding Moku o Loʻe, Kāneʻohe Bay since its introduction in 1978; however, a sudden decline in abundance (75%) occurred within a 30-day survey period. The consisent environmental conditions during the survey period, dominance of G. salicornia despite the presence of abundant herbivorous fish populations, and multiple observations of physical grazing by the green turtle, Chelonia mydas, on G. salicornia support our conclusion that C. mydas was the primary driver of the rapid decline of a persistent invasive macroalgae within a Hawaiian marine reserve. 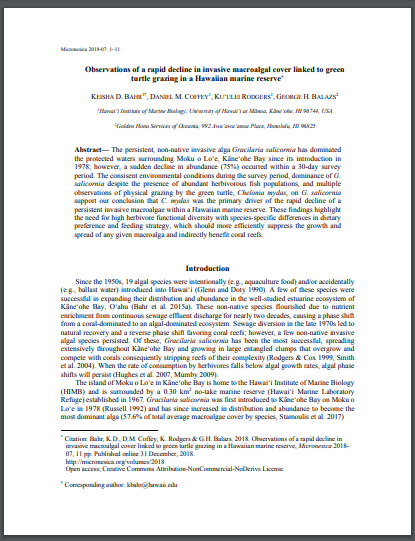 These findings highlight the need for high herbivore functional diversity with species-specific differences in dietary preference and feeding strategy, which should more efficiently suppress the growth and spread of any given macroalga and indirectly benefit coral reefs.